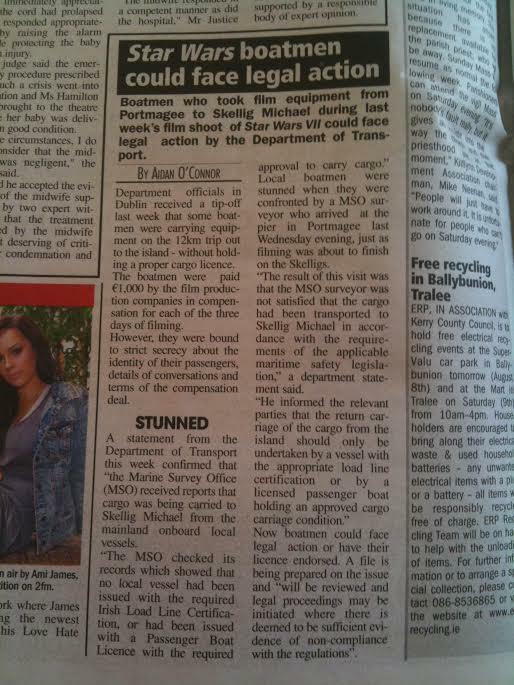 Boatmen from Skellig Michael could face legal action for lacking permits while working on Star Wars: Episode VII. Our buddy C.R. FitzGerald type out this whole article for us and gave us a great screenshot of it. Department officials in Dublin received a tip-off last week that some boatmen were carrying equipment on the 12km trip out to the island – without holding a proper cargo licence. Now boatmen could face legal action or have their licence endorsed. A file is being prepared on the issue and “will be reviewed and legal proceedings may be initiated where there is deemed to be sufficient evidence of non-compliance with the regulations”.